It's the end-of-the-year graph-a-palooza! Also, today is my birthday, so I can do whatever I want! Yay! 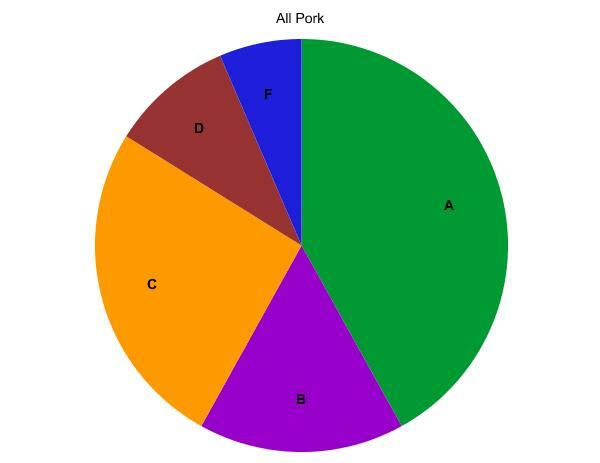 I find it interesting that pork has the most A grades and the most C grades - also the most F grades. Should we break it down further? 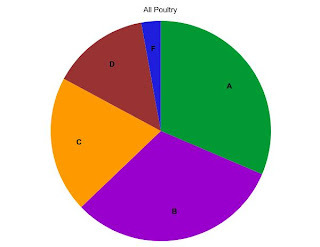 And that's it for my graphs. I hope you enjoyed them, as well as my total phoning it in this week. But again... holidays, birthday, end-of-year-stuff... you know how it is. I'll be back with new scathing or glowing reviews of exciting new fake meat. If anyone has anything they'd like me to test out or add to the website in the upcoming year, please let me know, otherwise I'll just keep doing what I'm doing. See you all in 2012! Okay, I admit - I've had these in my freezer for a long time. Someone else ate one a while back, but I hadn't gotten to them until very recently. So here they come: Boca Grilled Vegetable Burger. As per my usual veggie burger strategy, I popped it into a skillet with some oil. Flipped it once, got it nicely browned on each side, and threw it onto a bun. The verdict? Well, after I got past the mild freezer-flavor, all I could really taste was bell pepper. According to the website, there's a ton of stuff in here, but I couldn't pick anything else out. And, thinking back to the person who had tried them way back when, she wasn't terribly enthusiastic about them either. So I don't think the extra time in the freezer affected them TOO much. The texture was sort of the standard Boca burger texture, which was fairly chewy and burger-like, which is good, but several other examples of their burgers are just better, so I don't think I can really recommend this one in particular. This week, I'm checking out a frozen pizza: Tofurky Italian Sausage Pizza. This pizza has Daiya-brand fake cheese on it, so I was very curious to see if it could replicate the non-vegan pizza experience. Not much to say about the preparation - popped it into the oven, straight onto the rack for maximum crispiness, and out it came. One thing I should say is that this pizza is pretty small. The nutrition information says that a serving size is 1/3 of the pizza, and while that was an okay amount, the teenage boy and twenty-nine-and-a-half-year-old dude I was sharing this pizza with were both still very hungry after eating their third of a pizza. So plan for that, and if you're feeding several hungry people, maybe get two of these. Okay, the results. Let's start at the bottom with the crust. This was a VERY thin crust. More of a cracker than a pizza crust. It had a good flavor, and a nice crispy texture, but it was definitely very thin. Next, well, I can't really break up the toppings into fake-meat/cheese/veggies because they all sort of blended together. I could definitely taste the tiny shards of Italian sausage, and they added a nice spicy flavor to the pizza. As far as I could tell, the cheese was actually underneath all the toppings, because I couldn't actually see any of it, and that's usually fine. The texture of the cheese, though, was a little weird. Now, I'm used to pizza with the stretchy cheese experience - you know, where you take a bite and the cheese stretches out, connecting the pizza to your mouth before it finally breaks and slaps you in the chin with hot pizza sauce. Yeah, that sounds awful, but it's part of the experience. This definitely didn't have that, and I wasn't really expecting it to. But I think I was expecting a more chewy cheese - this was sort of a gooey, creamy paste. Perhaps when mixed with the sauce, it got weird. It wasn't a terrible experience, but not one I generally associate with pizza. As far as the rest of the toppings, there sure were a lot of veggies. Dare I say… too many? It was just edge-to-edge veggies - barely even any crust to hang on to on the outside, which isn't always a bad thing, but it made it a little tricky to eat. All in all, this was like eating a crispy cracker, with some sort of creamy spread, and a sausage-flavored veggie salsa. Not quite what my brain associates with pizza, but I really don't know what else you would call this, so I'll keep calling it pizza. As far as frozen pizzas go, this is quite a tasty experience, but the cheese left something to be desired for me. Okay, time for some more veggie seafood. You all ready? It's another Yves product: Yves Veggie Tuna Steak in Sesame Ginger Sauce. Once again, I apologize for Yves and their insistence in using Facebook instead of updating their website with actual information. I assure you, there's a post on there somewhere about this product, but it's just a picture with comments. I complained about the shape of the box when I reviewed the Veggie Shrimp, so I'm not going to get into it - just know that it is stupid. Before I discuss the cooking experience, I want to touch on the aesthetics for a second. I assume they were going for an ultra-realistic appearance with the "skin" sort of thing, but it looked really creepy. Sort of iridescent green-black, and I found myself wishing it weren't there. Who leaves skin on their tuna steak, anyway? I just did a google image search for tuna steak - four pages in, no steaks with skin on them. Just skip it, Yves. Looks better without it. So, the first thing I did with these was to heat some oil in a small skillet, as directed. I don't remember how long it said to cook these, but they browned SUPER fast. Way faster than the directions said they would, but as I've learned before, sometimes I cook things over a too-high flame, probably due to my impatience. So, once these were evenly browned on all sides, I poured the sauce over them. Now, I must stress this: BE CAREFUL when doing this. There is a lot of water in this sauce, and when you mix it with even the small amount of hot oil in the skillet, it splatters EVERYWHERE. I ended up throwing a lid on the pan just so that I didn't get splashed with piping hot sesame-ginger sauce. So yeah - just… be careful with it. Now for the tasting. Before I dumped the sauce over everything, I pulled out one of the strips of fake tuna, just to get an idea of what we were working with before I drenched it in sauce. It didn't have a very fishy taste - it was pretty mild. It did get fishier-tasting as it sat a few minutes after cooking, so if you're looking for that, you might want to wait a few minutes before eating it. The texture was pretty weird. The best way I can describe it was sort of like bread pudding. It was a little spongy and squishy, but not in a chewy way. It was very soft, and almost dissolved in my mouth. This wasn't an awful experience, but if you prefer your fake meat to be a little more toothsome, this might not be for you. As for the sauce, it was okay. 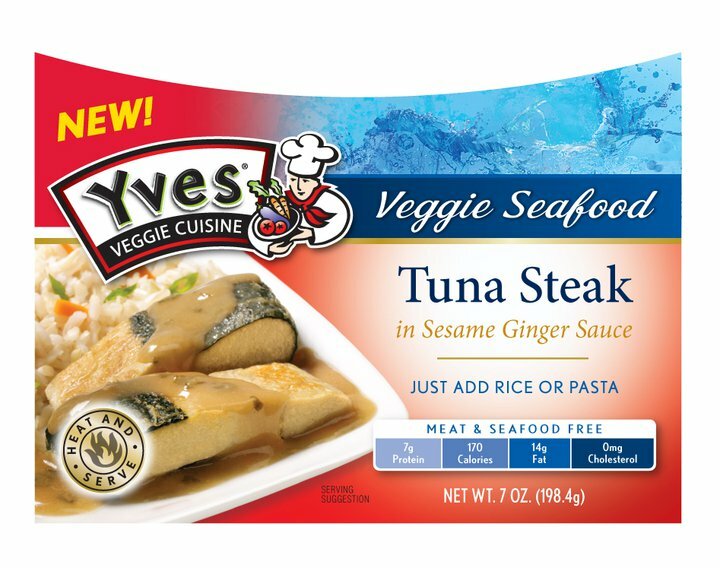 I don't really like sesame or ginger, so the combo wasn't terribly appealing to me, but it blended well with the fake tuna, so I guess that's good. I also might have been slightly bitter about the fact that my kitchen was coated in it. This week, something completely different. No fake meat involved here, but definitely fake something. It's Candle Cafe Macaroni and Vegan Cheese. In any case, let's check this out, shall we? First thing I should say is that this smelled really good while it was cooking. I was pretty optimistic. I stirred it at the appropriate time, finished cooking, then got ready to eat it. However, the fake cheese was still pretty clumpy. I kept stirring, to try to break down the clumps into a nice creamy sauce, like in the picture, and it did help a little, but I never got quite the result I was hoping for. But whatever, moving on. After my first bite, my poor mouth was a little confused. It felt like a super-rich, creamy cheese sauce, but it had almost no flavor. While no flavor is still better than bad flavor, I still wondered what I could do about this. Something I learned in culinary school is that if something smells great but tastes bland, sometimes it just needs a pinch of salt. So I sprinkled on a little bit, and that was a definite improvement. If someone had handed me this meal without telling me this was fake cheese, I would probably believe it was real cheese. Knowing that it was fake kind of biased things, but in all honesty, this was quite tasty. Kinda pricey, but worth it. 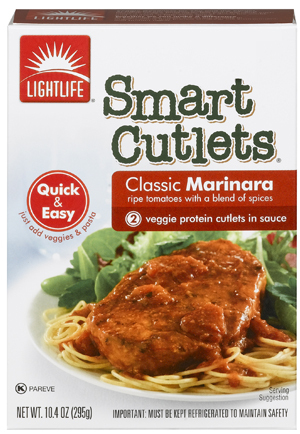 This week, I'm testing out Lightlife Smart Cutlets, Classic Marinara. I usually try not to do two similar reviews back-to-back, but I'm feeling lazy this week and dug this out of my already-written folder. Next week, something different, I promise. Now, I'm a big fan of Italian food. My grandmother was Italian, and I feel like, given some pasta, garlic, and tomatoes, I could be happy the rest of my life. So this is a pretty important product to get right, for me. Luckily, as long as there are garlic and tomatoes in here, there's a pretty good chance I won't hate it. So let's get started. To prepare these, I just heated up a skillet with a tiny bit of oil in it, as directed, and plopped both cutlets from the package into the pan, squeezing the sauce on top of them. Right off the bat, my first impression was that the sauce was a little bit too thick, but adding a little water (or, dare i say it… red wine?) might have helped that. Also, there wasn't quite enough of it for me, but again, thinning it out would also increase the volume. If you were going to serve this over some pasta for a main course, you'd definitely want to add some extra sauce, but for a sandwich or something, this amount was probably good for most people. Okay, so once it was heated up, I served them up onto a plate and gave them a taste. The sauce was good - not too sweet (which many tomato-sauce-makers have trouble with) and a nice, rich, tomato flavor. The cutlet was a little rubbery, but not too bad. With some pasta or on a sandwich this wouldn't be very noticeable, but I was eating it plain. Without the sauce, the cutlet itself did not have much flavor, but that's what the sauce was for, so I wasn't terribly concerned about that. The package recommended melting some mozzarella cheese on top, and so I absolutely had to try that. Is there anything NOT made better with cheese on top? I sliced a few thin slices of mozzarella, laid them across my second cutlet, and popped it into the toaster oven for a couple minutes, just to get the cheese all melty. This looked awesome, and I was very excited. Unfortunately, the addition wasn't a life-changer. It was good, don't get me wrong, but it wasn't that much of an improvement. I may, in the interest of science, have loaded up a single bite with a fairly obscene amount of cheese, just to see if there was an amount that made it awesome, and there was an amount of cheese that accomplished this, but I do not think I will be sharing that amount here. Suffice it to say, I don't think I could eat an entire cutlet with that proportion of cheese all over it, and neither should you. 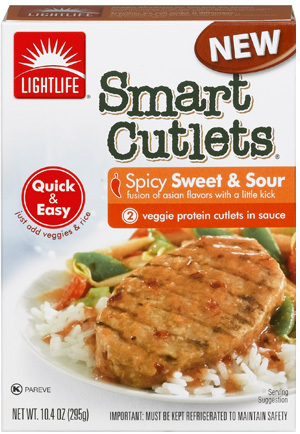 This week I'm going to be writing about Lightlife Smart Cutlets, Spicy Sweet and Sour. Somehow, when I bought these, I didn't notice that they said Spicy, right before the sweet and sour, so until I put a bite into my mouth, I had no idea. But I'm getting ahead of myself. First thing is the cooking. I heated up a skillet with a little bit of vegetable oil, then added the two cutlets and their delicious-smelling sauce. I was really looking forward to trying these. Once they were heated through, I transferred them to my plate. I was eating them plain, not on rice or anything, because I was feeling a little lazy. The texture of the cutlet itself was slightly rubbery, but not too bad. This would probably be less noticeable with other things, like a salad or stir fry, as they recommend. Flavor-wise, the first couple bites were pretty enjoyable. After those, though, the spiciness started to catch up with me. It was at the point that I looked at the box, saw the red chili pepper on it next to the word "spicy" and realized what was happening. In the ingredients list was "thai chili puree" which explained it all. I had to stop eating after the third bite, because it was probably going to kill me. I could have eaten more, probably, if it were on a bed of rice, with some other veggies and stuff to help cut the heat. That's just me being a spice baby. My wife thought they were fine, but she's a four-fireballs kind of lady. Okay, it's finally time to write about this new product. 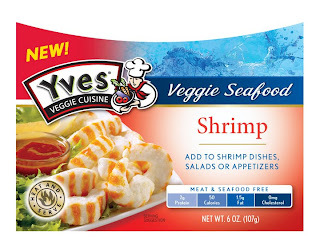 It's Yves Veggie Shrimp. I'd love to give you a link to their website with more information about it, but it appears that they've given up on their http://www.yvesveggie.com/ address, as far as updates. The same "new products" have been up there since I started writing my blog, and I know they've introduced more new products than those. For now, they're on Facebook, which seems to be where they're rolling out new product announcements. So I guess you can go here and scroll through all their posts. Unfortunately, there isn't much information other than what you can already see in the top left corner of this page. If you can't tell, I'm not exactly thrilled at this development. Anyway… moving on. Their new packaging… I'm just going to lay it out there, because I'm a little cranky today. The new box shape is stupid. You see how there's a curve at the top? That's actually the shape of the box. I picked up three or four of these, trying to find one that wasn't all smushed, before I realized they were shaped like that on purpose. Why would you want a box shaped that way? In looking at some of the other pictures on their Facebook page, some of them have the smushed bits on the sides rather than the top. Also dumb. What the heck are they doing? Before I get to the actual contents of the box, I'd like to share a story. The day I bought these, I was apparently very nervous about tasting them, so that night I had a nightmare about eating them. Not even kidding. This actually happened. In the dream, I was eating a piece of fake shrimp, and at first, it was very shrimp-like. However, the longer I chewed it, the stringier it got. But stringier isn't quite the word. Imagine taking a huge bite of celery and just chewing on it for a long time. Kind of a cellulose gum, where you know that more chewing isn't going to help, but you don't want to spit it out. Anyway, that was my dream. Reality time… I took the box out of the fridge, read the instructions (three cooking methods listed), and decided to try all of them. First test: cold. This was the one that frightened me the most. I'm not the biggest real-shrimp fan, so I had no idea what would happen with these. It smelled distressingly shrimpy. Distressing in an accurately-shrimpy way. Like, why would this combination of ingredients smell like seafood? I took a deep breath, steeled myself for the worst, and took a bite. It tasted also fairly fishy, I guess one could convince oneself it was shrimp, maybe with cocktail sauce or something. The texture, while not my nightmarish cellulose experience, was still pretty odd. Kinda chewy, but in the way that actual shrimp is kinda chewy. It was totally weird. Next test - heating in the skillet with a little oil. First warning, and the directions say nothing about this, pat the shrimp dry before dumping in the hot oil. Seriously. Right out of the package, there was a fair amount of moisture on them, and this splattered hot oil all over my kitchen and continued popping for a long time. It was pretty intense. So, be careful. After I finished dodging hot splattering oil and cooked the shrimp a bit, until it got slightly browned on both sides, I gave them another taste. With this method, they were actually pretty good. They were less chewy (in that slightly weird way) and the flavor changed. It's hard to explain how it changed, but I'm going to go with "just better". So things were looking up for this veggie shrimp. And then I tried the third method. The microwave. I put it in for the prescribed amount of time, removed it from the microwave, and took a bite. Or rather, I tried to take a bite. These things came out super tough and nearly impossible to eat. Sort of like my dream-veggie-shrimp. Do not do this to your veggie shrimp. You paid good money for this stuff - do not ruin it by putting it into the microwave. You've been warned. 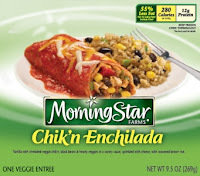 This week, it's another frozen entree: Morningstar Chik'n Enchilada. This was your basic frozen Mexican meal in a box - not too pretty, but with high hopes for deliciousness, I popped it into the microwave. A few minutes later, I stirred the rice side dish, heated it a little bit more, and then I was ready to go. It was…not bad. I added more salt, just so that I could actually taste the spices they put in. I always think it's so weird that, with so much sodium, so many frozen meals still taste bland. I understand that the sodium in the meal is not all sodium chloride (aka table salt), and that it is there for its preservative effects, not so much for its flavor effects, but still. It pains me a little bit to add more salt to something with so much in it already. But not so much that I'd choose to eat tasteless food instead. Okay, more details now that the seasoning-to-taste was completed. The enchilada itself was not too bad. The first couple bites had none of the fake chicken in them, however. After some mild dissection, I discovered that all the chik'n in it seemed to be concentrated in one blob in the middle of the enchilada. I sort of expected it to be smaller, bite-size pieces scattered throughout, but what mine had was one big chunk in the middle. Maybe I got an unusual one. What I learned though, from having half of the enchilada with the chik'n and half without was that I actually preferred the bites without. In this case, I think they'd do better just making a black bean enchilada and not even bothering with the fake meat. It wasn't bad, but it didn't really add anything, and the texture detracted a little bit from the experience. Probably because it was a big chunk, and the bites with the chik'n had very little of the rest of the filling. And only just now did I notice that the website says the chik'n in the enchilada is supposed to be shredded. I'm going to say that, for mine anyway, no it was not. It probably would have been much better if it was. This week it's another sausage: Lightlife Smart Sausages, Chorizo Style. I decided to cook these up into a nice chili mac. 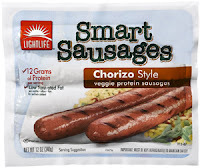 I tasted a bite of the sausage before I committed to this plan, in case I needed to switch gears, but plain and cold these weren't terrible, so I figured heating them up could only improve things. They had some reasonably nice peppery spiciness to them, but not much else, spice-wise. Just pepper. But whatever - there were plenty of other flavors in this recipe, so I figured it would be good. As a side note, I mostly used this recipe as written, but I substituted the poblano chile peppers for banana peppers, because that was what I had, canola oil instead of corn oil, and the fake chorizo instead of, well, real-meat chorizo. Otherwise, I actually followed the recipe. Oh and orzo for the macaroni, but that's still pasta. Well, and I skipped the first step. So maybe I didn't actually follow this recipe very well. Whatever. Okay, moving on. So now I have this orzo/black bean/corn/tomato/fake chorizo dish. All together, it tasted pretty good. I don't know if the chorizo was really the best option here. It had sort of a weird texture that is a little difficult to describe. Sort of mushy, I guess, is the closest adjective I can come up with. But also chewy. I found myself eating all the chorizo bits off my plate first so I could enjoy the rest of the dish without them. But at least I ate them, instead of picking them out and leaving them on the side of the plate. They were edible but definitely my least favorite element. 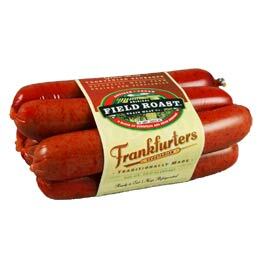 This week, I'm reviewing another hot dog: Field Roast Frankfurters. I followed the directions on the package for these to prepare them. I boiled a couple of them, still in their casing, for 10 minutes. This caused some funky red oily liquid to get into the water, so if you do this, don't plan on using the leftover water for anything unless you want funky red liquid in it. Also, it smelled really weird. Not really bad, just… weird. Once I fished them out of the water and removed them from their casing, I gave them a taste. I found the texture to be kind of hard and oddly dry. Not super pleasant. It had an okay hot-dog-flavor, but was entirely unsuitable for my planned usage (which was to mix it into macaroni and cheese). I ended up eating a few more chunks of it with some ketchup, which helped the flavor some, but the texture still wasn't great. I may try the alternative grilling instructions later and see if that helps the texture any. If I do, I'll be sure to update this review. Okay, wrapping up breakfast month. I really didn't mean to have so many Morningstar products this month - it just worked out that way. But here's one more: Morningstar Breakfast Patties made with Organic Soy. To be perfectly honest, I don't really get the whole organic thing. I don't know why it's such a big deal. But whatever - not for me to judge. 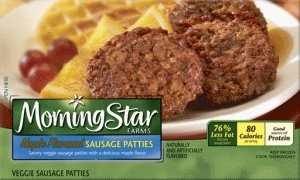 Once again, Morningstar thinks people actually want 2-inch diameter sausage patties. I have never seen an English muffin that small, so these are kind of useless for breakfast sandwiches, and that's a shame. Let's quickly cover the cooking instructions. On the box, it says to cook these for 8-10 minutes, "turning as needed to promote even browning". On the website, it says they cook for 11-12 minutes, turning as needed, etc. I cooked these for approximately 4 minutes, turning twice, and they were perfect. Lightly browned, crispy, not at all burned or anything stupid like that. Why are the instructions lying to me? Alright, enough whining, let's get to the tasting. These, well, tasted just like the non-organic-soy version. Very breakfast-sausage-y, a little spicy, but not too spicy. I don't really have much else to say about these - they're good. Texture - crispy and sausage-patty-ish - what more could you ask for? Flavor - tasted pretty much like I'd expect a breakfast patty to taste - nicely seasoned and a little bit spicy. 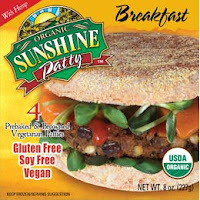 This week, I'm taking a quick break from Morningstar products to review Sunshine Burger Breakfast Patty. I had tried the original variety of these burgers a while back and wasn't impressed, but managed to add enough stuff to it to make it palatable. I was excited to try some of the other flavors which might actually have some… you know… flavors. So here comes the breakfast patty. 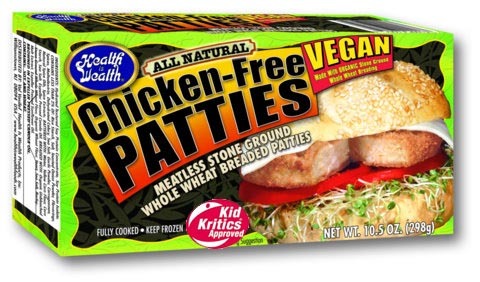 The website brags that this patty is, "an awesome taste sensation which is both familiar and completely new!" So there's that, whatever that means. So I cooked up a patty, sort of following the directions on the box. They were well-browned just a few minutes into the time suggested (5-7 minutes on each side), and hot all the way through, so I pulled it out of the pan. Why did they think it would take 10-14 minutes? I seriously was cooking it for about 4 minutes, and it was really brown. Maybe I'll just go ahead and cook one of the leftover patties exactly as directed and then mail them the ashes. I just realized that the instructions actually say to cook over low heat, so this time frame makes more sense. Sorry! Anyway, time for the tasting. I had been promised a familiar and yet new taste sensation, but I have to say, it reminded me very much of the last time I ate a Sunshine Burger. It tasted like a big mouthful of sunflower seeds. No sage, no pepper, (which they specifically named as spices used to season this patty), no any of the other ingredients listed. What a bummer. Maybe if I put it on an english muffin with egg, cheese, salsa, and maybe a different brand of sausage patty, I'd have something. This was not even remotely reminiscent of a breakfast sausage. But hey, if you like sunflower seeds and want to eat a bunch of them all at once, here's the perfect breakfast patty for you! 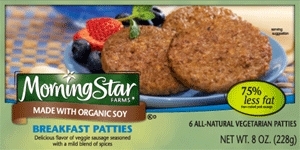 Continuing with breakfast month, I am going to tell you about Morningstar Maple Flavored Veggie Sausage Patties. I had eaten the plain sausage patties a while back, and had fond memories of them, so I figured they could only be improved by adding maple flavor. Once again, I was surprised by the size of these patties. Even though they were the same size as the plain ones, it had been so long since I saw them that I forgot how tiny they are! Seriously, I'm talking an inch and a half diameter. And, according to the nutrition information, a serving size is one. ONE! But they're packaged in pairs, so I guess that means they are fully aware of the fact that, like Pringles, nobody can eat just one. Or something. Anyway, I disregarded the directions entirely, and cooked these up in a little oil in a skillet for however long it took for them to brown. Unfortunately, I kind of overbrowned them a little bit, as I was distracted by also cooking pancakes and eggs. They weren't burned - just extra crispy. So, the eating… I did not detect any maple flavor in these at all. 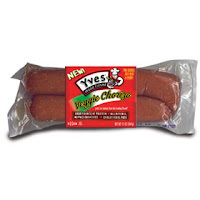 Just a regular sausage flavor with extra crispiness (my fault). I wanted it to taste like maple! I ended up dumping some maple syrup on them just to experience what it should have been like, and I'll tell you, it was pretty good. But it should have tasted like that right out of the box, otherwise, why call it maple-flavored? Texture - Extra crispy due to over-browning. Otherwise very sausage-patty-ish. Flavor - Tasted like a boring sausage patty. Not bad for a plain sausage patty, but disappointing for a supposedly maple-flavored sausage patty. This'll be a quick one, because even though I try to mix up my reviews a bit, I actually had almost the same thing as last week, and thought instead of spreading them out, I'll just go ahead and review them back to back: Morningstar Veggie Bacon, Egg, & Cheese Biscuit. This is very similar to last week's sausage biscuit, except, obviously, for the bacon. I was actually a little disappointed with my first bacon biscuit. I cooked it in the microwave, and, while reasonably tasty, it just didn't have much bacon flavor. In the oven, however, the smokiness was a bit more pronounced. Not hugely, but it was better. So, I still say the sausage version is better, but if you get the bacon ones, cook them in the oven. Flavor - the biscuit had a good buttermilk flavor, almost a little sweet; the filling was sort of indistinctly cheesy, but in the oven got more of a bacon flavor which was nice. This week, I'm going to start a breakfast series! Not sure if I'll make it through all of September, but I'll try. There are a lot of Fridays this month… Anyway, kicking off the breakfast series is a new product (according to the package anyway): Morningstar Veggie Sausage, Egg, and Cheese Biscuit. These looked flat-out delicious when I saw them at my grocery store, and I was very excited to try them. I got even more excited when I realized that the preferred cooking method was the microwave, and it would only take 45 seconds. That's super fast! So I unwrapped the biscuit, placed it, as directed, on a paper towel on a plate, and 45 seconds later, I had a piping hot biscuit with a bunch of stuff in it. And really, it is quite hot - I had to wait a little bit before I could eat it without burning myself. But once it cooled down a bit, I got right in there. I was a little skeptical that a biscuit would come out right from the microwave, but it was actually very good. The filling was nice and sausage-y. The egg and cheese parts were kind of just a random yellow goo - not much cheese or egg flavor, but overall it tasted quite good. The only thing I can really complain about is that the ratio of filling to biscuit was a little low. There seemed to be, at times, a lot of biscuit, even though it didn't look like it. But as the biscuit was really tasty, this wasn't really a major problem. The box also contained directions for a crisp crust, baked in the oven. I decided to also test this out, since I was curious. This version is a bit more time consuming. First, preheat your oven to 400 degrees. Then, and here's the part that almost got me to skip this test, bake for 20 minutes. Holy crap that's a long time to wait for something that you could be eating in 45 seconds. But, science was calling me, so I waited patiently for my timer to go off. Finally, the timer went off, and I busted that thing out of the oven. The crust was … I don't even know how to explain it. Crispy, obviously. Borderline crunchy, I might even say. What I will say for sure is that this new cooking method totally transformed this breakfast biscuit from something fast and tasty to something super delicious. I would highly recommend trying this method out if you have the extra time to spare - it actually seemed to overcome the filling-biscuit ratio problem that the microwaved version had. Not sure how that works, but there you go. This week is an auspicious week, indeed. Not only did this past Wednesday mark the two-year anniversary of this blog, but this post is my 100th review! 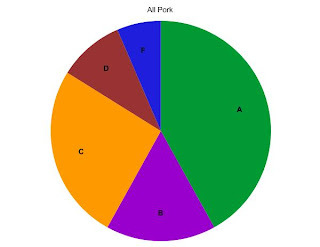 It's hard to imagine that I've eaten one hundred different varieties of fake meat, but there you have it. Actually, a handful have been repeats, but mostly at the beginning when I was just figuring this whole thing out. I wish I had something super cool to celebrate with, but the only idea I came up with (which was very cool), took more time than I had, so I'll use it later. So what I'm going to settle for is a regular review. 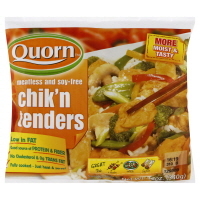 I'm going to tell you all what I think about Quorn Chik'nTenders. I had this leftover pasta thing in the fridge that was really tasty. There was zucchini, summer squash, chickpeas, tomato, parmesan, and some herbs and spices (garlic, parsley, oregano, and basil). It was already pretty tasty, but since it was being eaten as leftovers, I thought I'd cook up some chicken to go with it. Unfortunately, I was all out of chicken. How does that happen? Luckily, I had these to (hopefully) fill in the gap. I tossed them into a skillet with a reasonable amount of vegetable oil, some salt and pepper, and a healthy amount of garlic powder. Even though they do contain garlic powder, according to the ingredients, I was pretty confident that there wasn't going to be enough. So I cooked them up until they started to get nicely browned. Then I popped a chunk into my mouth to see how it was before I mixed it into my pasta salad. Oddly, it had a very strong stuffing flavor. Like, what you serve at Thanksgiving dinner next to the turkey (or fake turkey or whatever) and cranberry sauce. Not only did it have a stuffing flavor, but also a very bread-y texture, also like stuffing. I think maybe the Quorn folks are confused about what they were trying to imitate. Because honestly, these were tasty, but definitely not chicken. These were totally stuffing cubes. As it turned out, they matched just fine with my pasta salad, but only because any other flavor these cubes were paired with automatically trumped any stuffing flavor. Even a chunk of zucchini was hugely overwhelming of the apparently terrifically fragile flavor of the chik'n cube. Once any other competing element was swallowed, however, whatever bits of chik'n remained in my mouth reasserted their stuffing flavor. This is a strange experience, but not an unpleasant one. Considering that Quorn is claiming this as a chicken-analogue, however, I had to downgrade it a bit. This week, another frozen entree: Morningstar Lasagna with Sausage-Style Crumbles. I was looking forward to testing this one out, because it looks pretty tasty on the box. It was as if I've never eaten a frozen entree before. Once out of the box, the actual food inside doesn't look quite like the picture. Obviously. It looked kind of like a pile of vegetables and sauce on top of a noodle. I think there were a couple noodles in there, but the lasagna was pretty short. No towering stacks of delicious lasagna goodness. But whatever. I cooked it in the microwave, and dug in. First impressions, there was a lot of fennel in here. 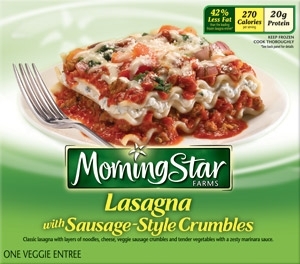 I haven't been able to test out the Morningstar Sausage-Style crumbles, because it seems that no stores around me carry them, so I can't say for sure if it was the crumbles themselves or however the lasagna is built. And maybe, for other people, the mega-fennel flavor isn't a problem. Aside from that, and maybe I'm channeling my Italian grandmother here, but I wasn't terribly impressed with this lasagna. There wasn't much to it. I need a big, cheesy, gooey, saucy, noodly experience when I eat lasagna. This was … disappointing. Not bad, but not mind-blowing. Luckily, I cooked up some broccoli and garlic bread to accompany this, so I didn't leave the table hungry. 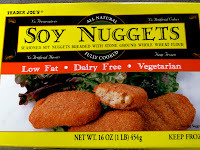 This week, it's another chicken nugget: Boca Original Chik'n Nuggets made with Natural Ingredients. I cooked these up a couple different ways, since I didn't want to spend an eternity preheating my oven just to cook these up. So I figured I'd combine their microwave method and their oven method. I put them on a plate and microwaved them for a couple minutes, mostly to thaw them out, then tossed them into my toaster oven to crisp them up. This was… sort of successful. They were certainly crispier when they came out than when they went in, but not a lot. Really, I should have just cooked them longer in the toaster oven. The interior was kind of mushy, although the flavor was good. The next time, I put them straight into the toaster oven. I set it for 5 minutes, then flipped them and gave them another 5 minutes. After I checked them, I wasn't happy yet with the crispiness level, so I cooked them another few minutes until they were good. The satisfactory exterior came along with a satisfactory interior as well, so this was definitely the way to go. It was nice and … not quite chewy, but not mushy either. Kind of like a real-meat nugget when it's cooked enough. I was definitely impressed with these. But keep them out of the microwave! 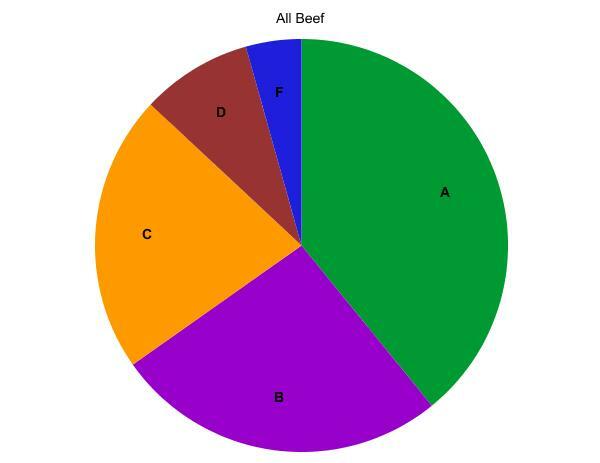 This week, I'm tackling another fake steak. 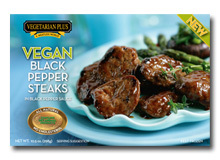 It's Vegetarian Plus Vegan Black Pepper Steaks. Sorry for the generic link - they don't want to make things easy. Just click on Products, then Steak Meat-Alternatives and finally Vegan Black Pepper Steaks. Phew. Okay, moving on. I've tried a product from this company before, with unpleasant results. But I was informed that the microwave method, as I suspected, was actually the worst way to eat them. So I took that lesson to heart when preparing these black pepper steaks. These didn't look like they would necessarily benefit from being in the oven, so I opted for the stovetop method. I did pop it in the microwave to defrost it, but then it was straight into the pan. One thing I would change about the directions, however, is the vegetable oil. They recommend adding a small amount of oil to the pan, but I'd argue that there is enough sauce to render the oil unnecessary. Use your judgement. Next up, the nutrition information says that this package contains four servings. Four? I can argue for two servings, maybe three if this is one course of a five course meal. So, plan for that, people. Okay, so we've covered cooking, and teeny serving size recommendations. Now, my experience. 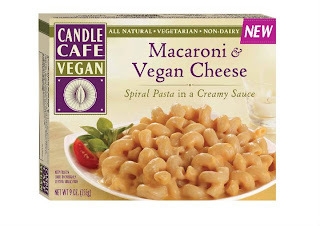 I ate these with some garlic mashed potatoes (which it suggested on the box, actually). This was a good call, for a few reasons. First reason, the sauce for these dealies is a little bit sweet. Not something I noticed with my first bite, but after a couple, it got more cloying. The saltiness of the potatoes helped balance that out. Also, as one would naturally expect from a box labeled "pepper steak", the sauce was very peppery. Not unpleasantly so, but adding the potatoes helped decrease the chances of biting down on a huge grain of pepper. Maybe some people are into that. I don't know, but I'm not. More about the meaty bits themselves - they had a surprisingly steak-like texture. Quite chewy, but in a meaty way, not in a rubbery way. I was actually pretty impressed. Unfortunately, as these cool, they do get tougher and tougher, so eat them quickly. I wouldn't say they tasted very steak-ish, but with the peppery sauce, the chewy texture, and the clever veil of mashed potatoes, I could see how someone could imagine they were eating steak. And aside from the slightly extra sweet sauce, there were no unpleasant flavors going on. 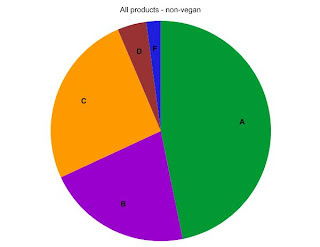 Not too bad, VegeUSA! Time to finish up burger month. Last up: Boca Original Vegan Burger. First, let's talk marketing. The description on the website says this burger, "cooks up juicy and satisfies big appetites." I kind of like it when companies don't shoot too high. It gives a good starting point. Usually it's only uphill from here. Also, the photo on the box shows this awesome, dark brown burger with fancy grill marks and everything. Unfortunately, the actual burger is more… beige. Not off to a great start here. I go ahead and cook it up anyway, because, well, I'm committed by this point. Sadly, the fancy grill marks are only painted on one side. I don't know why this disappointed me, but it did. And then, to my astonishment, the grill marks disappeared when I cooked the burger! Gone! Where the heck did they go? How does this happen?!? Alright… disappearing grill marks aside, I gave this a taste. It actually was pretty tasty. I wouldn't say it tasted like a beef burger, but hey - it doesn't look like one, either. It does have a sort of generic meaty flavor, which is pretty pleasing. Maybe one could trick oneself into believing it was some sort of poultry burger? All in all, it was a disappointing start with a surprisingly satisfying finish. Oh, and it definitely did cook up juicy. High fives for low expectations! Flavor - vaguely meaty, but not beefy - possibly poultry-ish? Definitely pretty good. 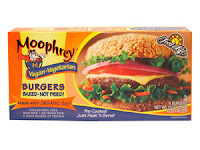 Next up in veggie burger month: Moophrey Vegan Burgers. 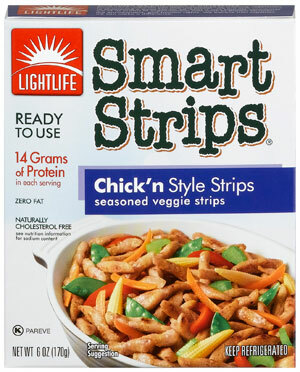 I gotta say it again, these and the Cluckphrey fake chicken products have the BEST names for fake meat. But there's more to fake meat than a catchy brand name, so let's dive in here. Standard veggie burger routine here - little veggie oil in the skillet, few minutes on each side until hot. I toasted up the bun, just to be fancy, and slathered this thing with ketchup. It looked pretty burger-y, but it had kind of a funky smell. I carried on anyway. Took a big bite of the burger and almost immediately wished I hadn't. It just tasted…bad. So bad that I really wasn't able to spend a lot of time figuring out what flavor of bad was in play here. 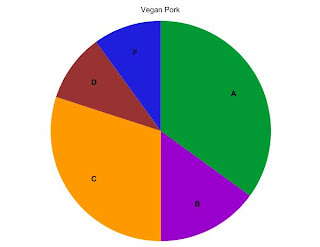 I did force myself to take a second bite with just the patty to try to narrow down the problem, but all that got me was a confirmation of my strong suspicion that the patty was the problem. I had so little interest in continuing sampling of this burger that I actually just tossed it out. I kept the bun and cooked up another Amy's Quarter Pound Veggie Burger from last week. So no worries, the bun did not go to waste! 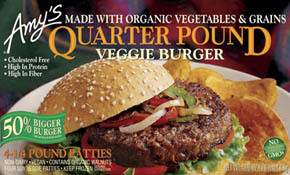 Continuing burger month, this week I'm checking out Amy's Quarter Pound Veggie Burger. This is a seriously substantial burger, people. When you hear about a quarter pound real-meat burger, they're talking pre-cooked weight - it loses some of that by the time it hits the bun. This veggie burger, however, is actually four ounces. To prepare this massive burger, I heated up some vegetable oil in a skillet, as usual. Few minutes on each side, and I was ready to go. I also toasted up a bun and dug some caramelized onions out of my refrigerator. Couldn't remember exactly how long those had been in there, but they looked fine. I also decided to throw some cheese on there, thus canceling out the vegan element, but I'm not vegan, so that felt okay to me. Plus, I did snag a bite with no cheese, just for testing purposes, so the science is still good, such as it is. In any case, completely naked, the burger was pretty tasty. Had a decent consistency to it and a nice ambiguously savory flavor. With all the fixings it was very satisfying. I probably wouldn't have missed the cheese, to be perfectly honest. This is a good burger. It doesn't taste much like meat, but it's definitely hearty. This is a serious veggie burger. This burger doesn't mess around. Summer is all about burgers, so starting this week, July is going to be all about fake meat burgers! First up, Trader Joe's Vegetable Masala Burgers! I was pretty skeptical that these would be any good. I went ahead and cooked one up anyway, because, well, that's what I do. Little oil in a skillet, few minutes on each side, and away we go! First of all, these are not intended to replicate a real-meat burger. I knew this going in, so I was prepared. Looking at it, I could tell that it was basically a bunch of vegetables mushed together with spices. I was not wrong. The basic binder of this burger is potatoes, which made the whole thing sort of taste just like a fried potato pancake. Nothing wrong with that - fried potatoes rule! I could occasionally taste other veggies - there was corn, there were peas, there were peppers. Most surprisingly, there were Indian spices! Pretty strong flavors, which I was not expecting. And delicious ones, no less! After a couple bites, I started to notice some heat as well. Not temperature-heat, spiciness-heat. It was right at my upper limit - most people would have no problem, and people like my wife probably wouldn't even notice. I'll bet this would be crazy-tasty with some chutney. When I eat the rest of these burgers, I'll be sure to try that out. Texture - crispy exterior, soft-potato interior - like a fried potato pancake. 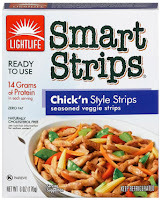 This week, another Lightlife review: Lightlife Smart Strips Chick'n. I did something really weird with these. I was in the mood to introduce our exchange student to something REALLY Minnesotan. People outside Minnesota probably won't understand this, but anyone living here will. I made hotdish. People anywhere else in the world would probably look at this meal and say, "no wait - that's a casserole - what the heck is a hot dish?" to which a Minnesotan would point to the tater tots on top and say, "Definitely hotdish." Basically, hotdish is any combination of foods, usually including cream of mushroom soup, baked together, with tater tots on top. To be perfectly honest, I've never made one, and I've lived in Minnesota for 19 years. It was time. I decided to fancy it up a bit - after all, I graduated from culinary school. So I started with some quinoa. If, somehow, you don't know what this is, look it up. I cooked up some quinoa while I was wilting some farmer's market spinach in some olive oil. Shredded some Swiss and Monterey Jack (I think…) cheeses, and stirred everything together with the obligatory can of cream of mushroom soup. At this point, you might be wondering where the fake meat comes in. The answer is right now! I tore open that package of chick'n strips, sauteed very slightly with some onion and garlic, and tossed all that in as well. Finally, seasoned to taste with salt and pepper, dumped it all into a 2-qt casserole dish, topped with tater tots, and baked until the tots were reasonably crispy. Voila! My first hotdish! So how did it go? Pretty well. The chick'n strips provided a reasonably chewy texture, but the flavor wasn't working very well with the rest of the team. It had a weird flavor of its own which I didn't really appreciate. I ended up picking out the chick'n bits and eating them all first, then diving into the rest of the meal. This week, I got a little creative with my fake meat. Not hugely creative, but a little. 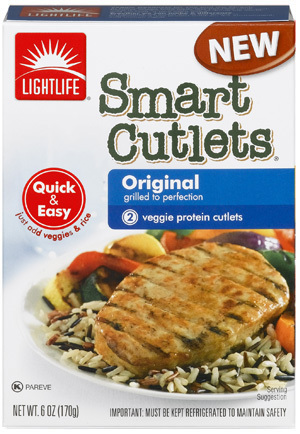 I decided to make a sandwich out of Lightlife Smart Cutlets, Original Flavor. I was in the mood for a sandwich, which doesn't happen too often. As I'm sure I've written about before, I'm not enamored with the sandwich as a delivery system for food. I didn't make any regular sandwich though - I went with a Caesar chicken sandwich. I busted out some romaine lettuce, parmesan cheese, and my Caesar dressing. A quick note for vegetarians (who actually probably already know this): traditional Caesar dressing contains anchovies! As did mine, so technically my sandwich wasn't vegetarian, but neither am I so it all worked out. I cooked up the cutlet in a skillet with a little olive oil and some garlic powder, oregano, and basil, to give it a head start on the Italian flavors. I even toasted my hamburger bun, just to give it a little crispiness. Then I shaved off a few slices of parmesan cheese, tore off a couple pieces of romaine, and built my sandwich, dousing the whole thing in Caesar dressing. Now, to be fair, the dressing kind of overwhelmed any other flavors that may have been present, so my first impression of this sandwich was that it was very good. The texture of the cutlet wasn't mushy or chewy or any of the other things I usually use to describe fake chicken. It was nice and tender - not weird at all. I couldn't taste much of anything, so I broke off a piece and ate it separately from the sandwich. It wasn't a revelation on its own, but it wasn't awful either. Its purpose here was not to taste like chicken, but to provide a chewy counterpart to whatever else you were eating. In this case, it succeeded admirably. I enjoyed my sandwich very much, and highly recommend these cutlets for this application. Sorry to disappoint everybody, but I'm taking this week off to recharge. I'll be back next week with a brand spanking new review! This week, you get a bonus revelation with your standard Friday review. How exciting! I'm delving once again into the crazy world of homemade fake meat. I haven't had great luck with this in the past, but I'm bound to find something eventually that works out. This time around, it's pepperoni! I found a recipe here that looked promising, picked up the one or two ingredients that I didn't already have on hand (my pantry is awesome!) and got to work. I cut the recipe in half, since I had no idea whether it would work or not. This recipe came together super easily. Took about 15 minutes to mix it up - mix the dry, mix the wet, mix the wet into the dry and knead. For once I didn't even mess with the ingredients. Everything went in as written. The instructions said to roll it into a log, but once I got it all together, there wasn't much shaping to be done - it was incredibly stiff. Plus, the mixture was so tough it started to reject the fennel and mustard seeds - they just kept popping out. I stuck them back in as well as I could, wrapped it in foil, and popped it into the oven. During the hour it was in the oven, some delicious pepperoni-like smells started to come out of my oven. I started to get pretty optimistic that this might actually be good. I forgot to turn it over halfway, as instructed, but I don't think that mattered. One thing that I think is very important to mention: the recipe says to remove it from the oven and unwrap it - be very careful, because that thing is filled with super hot steam. I totally burned myself when I untwisted the end of the foil. Steam comes shooting out as soon as it has an opening. So wear oven mitts or something - maybe use tongs. Seriously. Be careful. So, once it cooled down, I cut a slice of it to give it a taste. It was…interesting. It wasn't quite pepperoni, but it was a spicy, chewy thing with fennel. I was a bit underwhelmed, to be honest, considering how good it smelled. I stuck it in the fridge and went about my day. The next day, I was making a mini pizza for my lunch, and I remembered this was in the fridge. I know I'm going to be in the minority here, but I am a big fan of pepperoni and pineapple pizza. I figured this would be an optimal time to test out the pepperoni in its natural habitat - pizza! So I cut a few thin slices, layered them on the crust with some tomato sauce, mozzarella, and pepperoni, and baked it in the oven until the crust was crispy and the cheese was gooey and slightly browned. Yum! Then I had a bite. It was pretty good! Again, not exactly pepperoni, but pretty tasty in its own right. I had a couple more of these pizzas over the next week or so, then over the weekend, a revelation hit. I now understand the point of fake meat. It isn't meant to perfectly duplicate the experience of eating meat, but instead to evoke feelings of the experience of eating meat. 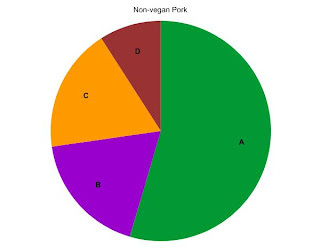 When I was eating the pizza with the seitan pepperoni on it, while it wasn't exactly pepperoni, it was spicy and chewy, which is basically what one gets from eating pepperoni. The only thing missing was the grease factor, which I didn't really miss, personally. This revelation seemed very profound at the time. Maybe everyone else already knew this, but nobody told me, so I'm going to assume I'm first in line here. I was tempted to end the blog on this note, but I still have a bunch of fake meat in my freezer, so I guess I'll just keep going. At least it all makes a bit more sense now. Texture - Chewy, but not weird-chewy. Pepperoni-chewy. Flavor - Spicy and fennel-y. I could do without the fennel, personally, but that's just me. Oh no - it's time for another hot dog review! This time, it's Yves Good Dog. I may have mentioned before that I like to cut up hot dogs to add to my macaroni and cheese from-a-box. It's something that dates back to my childhood. Fond memories and all that. So perhaps these had a pretty high standard to live up to. 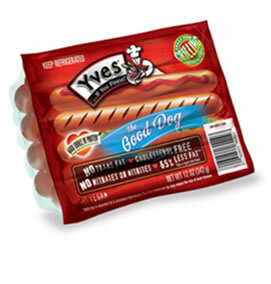 I really enjoyed the heck out of the corn dogs that Yves makes, so I was hoping for the best with the naked dogs. I followed the directions as carefully as I could, since I've gotten slammed before for making things up. I put them in a bowl of water (had to cut them in half to get them to fit properly while submerged), covered the bowl with a plate, and microwaved them for one minute. They were making all kinds of crazy noises in there, but I just kept going. When I pulled them out, they were nice and hot, but also weirdly blistered-looking. I guess real-meat hot dogs do that too, so I moved forward. I sliced off a chunk to taste it, and discovered that the texture was pretty similar to a real-meat hot dog. It even had a bit of resistance in the skin. As it cooled, however, it started to get really tough and chewy which wasn't fantastic, so if you eat these, be sure to eat them quickly. Flavor-wise, these weren't too bad for a veggie hot dog. I don't think they had a very hot-dog-ish flavor, but judged on its own merits, it wasn't too bad. I tried it with a little ketchup, and it was a little better, but mostly because I could taste the hot dog less. I ended up eating a little bit more with dollops of ketchup, then just eating my mac & cheese without the veggie dogs. Not a perfect substitute when the flavor is critical to the experience. On a bun with some potato chips on the side, I bet this would be perfectly adequate. 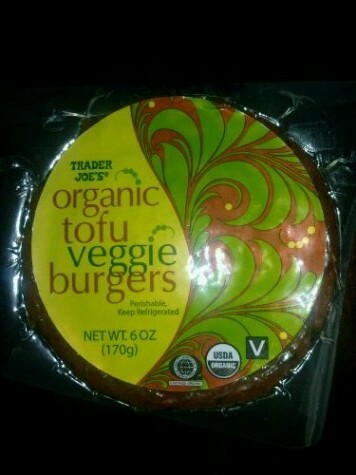 This week, it's another veggie burger: Trader Joe's Organic Tofu Veggie Burger. I cooked one of these up one night when I was short on time and just wanted something quick and easy. Definitely lived up to those expectations. I put a little vegetable oil into a pan and cooked this burger until it was nice and crispy, tossed it on a couple slices of bread (no buns in the house, unfortunately) and gave it a taste. I tasted bread, and that was about it. It didn't taste like anything. I was very disappointed. I had our Japanese exchange student give it a taste, and she informed me that it did not taste like nothing - it tasted like tofu. Which makes sense, since that was right there in the name. But apparently to me, tofu tastes like nothing. I even tried to jazz it up with some mayo and some ketchup. Turns out, this veggie burger had an anti-flavor - it actually removed the flavors of the mayo and the ketchup so that all I could taste was the bread. What the heck? 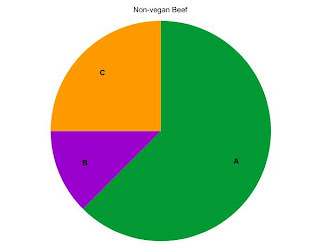 Now I'm not sure what to do with the remaining veggie burger in the fridge… Hopefully I can get our student to eat it, because I'm not interested. 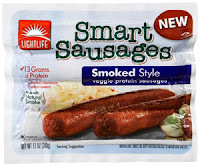 This week, I'm tackling another sausage - Lightlife Smart Sausage Smoked Style. I'd tried their Italian style before and had good results, so I was looking forward to trying this one out. I decided to cook up some jambalaya with this sausage. I admit - I also threw in some shrimp, but I don't think it had any effect on my review of this sausage. I made sure to not overcook this sausage, because fake meat doesn't tend to fare well if overcooked. I even had a quick taste before I cooked it up to see what kind of flavor we were working with. Unfortunately, this quick taste put quite a damper on my excitement for the meal. This sausage had no resemblance to any other real-meat smoked sausage I've ever eaten. It just had a kind of fake-meat taste to it and nothing else. I figured that since the flavor wasn't actually bad, I'd keep going. This dish sort of relies on a strong meaty flavor to season the rest of the meal, and without any kind of flavor from the sausage, the whole meal was kind of bland. I threw in extra cajun seasoning just to pep it up a bit, but it was still lacking. Maybe if I had some MSG sitting around, I could have thrown that in and perhaps gain back what was missing, but as it was, I was just let down. This week, it's Yves Veggie Chorizo. I did something kind of weird to this product that I hope you can all forgive me for. I made nachos! My exchange student was home from school for some reason, and she wanted nachos. I saw this as a great opportunity to bust out the package of veggie chorizo we had in the fridge and test it out. So (and here comes the bad part) I took a chunk of remaining-nameless processed cheese and melted it down with the chorizo. For valid testing purposes I did taste a bit of the chorizo before mixing it with the cheese, and was a little worried. Usually, with chorizo, there's some degree of spiciness. Not the case with this one. It was actually a little bit sweet, which didn't bode well for our nachos. I thought maybe, mixed with cheese, the sweetness would subside a bit, but it did not. In fact, even with salsa, lettuce, black olives, and sour cream, there was still a pervasive sweetness that was a bit off-putting. Not terrible, but not great. I definitely prefer other chorizos I've eaten over this one. A while back, I tried my first variety of Nate's Meatless Meatballs. 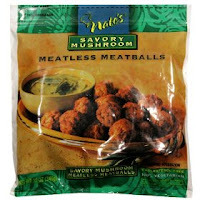 This week, I'm testing out a new flavor: Savory Mushroom Meatless Meatballs. I went super traditional with these and had them with spaghetti and a tomato sauce. No messing around on this one. I even followed the directions, which said to put the frozen meatballs into the sauce and simmer for 10 minutes. Not that I could have changed it around too much, but whatever. I'm sure, if I put my mind to it, I could have figured out a way to modify it. Unlike last time, where the texture was very delicate, these held together much better. More like a real-meat meatball. I would assume that's because I cooked them in the sauce instead of baking them in the oven, although I'd think that cooking them in sauce would make them more fragile. Oh well. These seemed like they were going to be a huge success. Until I put one in my mouth. The first thing I tasted was a general weirdness. Couldn't quite place the flavor, but it wasn't mushrooms. After a few bites, I managed to convince myself that it was kinda mushroomy, but not amazing. It wasn't a bad flavor, just not great. I ate the rest of the meatless meatballs on my plate, but left the remainders for my exchange student to bring to school for lunch. Flavor - Not very mushroomy, just… odd. 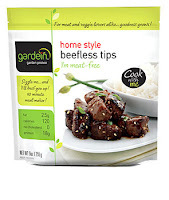 This week, I'm checking out another Gardein product: Gardein Homestyle Beefless Tips. It's been a while since I went all out with a fake meat, and this one seemed to have a lot of potential. I was in the mood for a stir-fry, which we do pretty regularly at our house. A friend of mine had brought me some heirloom cherry tomatoes in a variety of colors, which I figured would go pretty well in a stir fry. I was trying to decide between chicken and pork when I remembered I had these in the freezer. Suddenly the whole meal came together in my head. Beefless tips, broccoli, red onion, and rainbow-colored cherry tomatoes in an oyster sauce. It was going to be beautiful and delicious! My only hope was that the beefless tips wouldn't ruin everything. I charged ahead confidently, whipping up a super tasty oyster sauce from The Best Light Recipe, while I soaked some rice noodles to go with it. Cooked up the beefless tips, set them aside so they wouldn't overcook, cooked up the broccoli and onion until they were nice and soft, threw in the tomatoes just long enough to wilt them. Poured in the sauce, heated until thickened, added the beefless tips back in, along with the soaked noodles, and tossed all together. It was indeed a beautiful meal. I served it up and we got ready to taste. I have no complaints about the flavor of the beefless tips. It didn't have a very strong flavor of its own, so it didn't fight with the sauce at all. It just had a sort of general savoriness to it. Not beefy, just savory. I was okay with that. The problem was the texture. Forgive me for the comparison, but it really resembled wet bread. Not your average grocery-store sandwich bread, though. More of a European-style chewy bread that had been soaked in some sort of liquid for a while. Not too long that it was mushy - just soft. That texture doesn't freak me out as much as it does for some people, but it made me wish that I was eating real meat. After a few chunks of it, I kinda got used to it, but I wouldn't say I liked it. Definitely the weakest link in the stir fry. Not bad enough to ruin it, though. Just not as amazing as the rest. This week, I'm tackling another vegan fake meat - Health is Wealth Chicken-Free Patties. Here's the thing, I actually tested these out a really long time ago, but it was during a week where I was really sick with a bad cold. It didn't taste like anything, but I could tell if it was because the patty didn't taste like anything or if it was just me, so I put them back in the freezer and waited until I got better. Then forgot about them for a while. Eventually, I dug them back out and gave them another shot. I heated these up in my toaster oven, just for giggles. I figured it'd get a nice crispy exterior without spending all that time preheating my oven. It worked great! After only a few minutes, it came out all hot and crispy, so I tossed it onto a bun and took a bite. Something I had noticed back when I tried these out the first time is that the texture of the interior is not awesome. Pretty mushy, actually. This seems to be a sticking point for anything trying to resemble chicken. It's either tough and chewy or mushy. I understand that muscle texture is probably very tricky to replicate, but somebody needs to get on that. Texture aside, let's talk flavor. As it turns out, whether my nose is all clogged up or not, these actually have no flavor. None at all. Not even a gross flavor. I loaded up the patty with ketchup and mayo, and it was definitely palatable, but I derived no pleasure from eating it. I recommend eating these with a cold - you could at least pretend you were missing out on something that way. Texture - Crispy outside, mushy inside. This week, I'm testing out another veggie burger: Boca Savory Mushroom Mozzarella Veggie Patty. First, a disclaimer. I'm not the biggest mushroom fan. Over the years I've learned to appreciate them more, but I don't usually seek them out. That said, here comes the review. Not much to say here - heated up a patty with some oil in a skillet, just like I always do. I served it up on a homemade onion bun (because I'm like that) with some lettuce and tomato. I dug in, expecting a savory mushroom and mozzarella experience and got only onion bun, lettuce, and tomato. I figured all that awesome interference was drowning out the mushroom flavor, so I dissected the burger to get a taste of it plain. Once I got it alone, I could taste the mushroom flavor. Sort of. I think I could only taste it because I knew it was there - if someone just handed it to me and asked me what it was, I'm not sure I would be able to pick it out. And there was absolutely no mozzarella flavor presence, but that I can forgive - mozzarella isn't exactly the most assertive cheese out there. Maybe a Swiss version would be a little more interesting. As it stands, though, this burger was a bit of a letdown. This week, I'm testing out another fake meat chicken nugget. 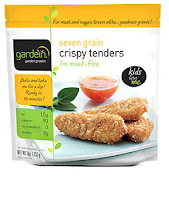 Let's see how Gardein's Seven Grain Crispy Tenders stack up against the competition. This is one time where I can actually say that the product looks at least as good as the picture on the package. In this case, it looks a little better. They really do look like picture-perfect little chicken fingers, and that excited me. And this was even before I cooked them! So I popped them into the oven (which I heated only to 425 degrees instead of the rather odd 430 degrees the package recommended), set a timer for 10 minutes, then flipped them over and reset the timer for 10 minutes, just like the directions said. By the time they were finished, I was really looking forward to the experience of actually eating them. I was disappointed, however, by the fact that I couldn't actually cut through them, they were so tough! I had to pick it up and use my teeth to bite through it. I had a suspicion that 20 minutes in a 425 degree oven was a little unreasonable (even though the directions sternly reminded me to not overcook them!) so I was glad I didn't bake them all at once. I had some left over, which I cooked a different way. The package also has toaster oven directions, and while I cannot set my toaster oven to any particular temperature, just a time, it's a real trooper, so I thought I'd give it a go with these. The toaster oven directions said to cook them for 15-20 minutes, so I immediately disregarded that and set it for five, then flipped them over to get a status check. They were hot but not yet sizzling, so I put them in for another five minutes. At the end of that, they looked nice and hot and were sizzling, so I took them out and laid them out on a paper towel to help absorb some of the grease (there wasn't a lot) and promote crispiness. After about 30 seconds of sitting there, I just had to test them out. Luckily, they were nice and tender this time, with a delightfully crispy exterior. Not as crispy as most of the other nuggets I've tested out, but the interior made up for that. It wasn't mushy like many others, and it actually had some sort of flavor of its own. I can't say it was perfectly chicken-y but it was good. I admit it took a couple bites to get into it, but even the first bite was pretty okay. After tweaking the cooking time, these came out quite good. This week, it's time for another veggie burger! I'm going to tell you all about Morningstar Tomato & Basil Pizza Burgers. As soon as I saw those I knew I had to try them. I mean, I like pizza, and I like burgers - how could a pizza burger not be awesome? To start, Morningstar has no idea how long their food takes to heat up. They say that it will take 10-11 minutes in a skillet for these to be ready. I spent about 5 minutes from the minute I walked into the kitchen to actually taking my first bite. So please, use your judgment - just cook it until it's hot. I had no idea what to eat this burger with, so I just put it on a bun, figuring that I could always add things later. Turns out, it needs nothing. Not even sure it needed the bun, but it would have been a little messier to eat without it. I cooked it in a teensy bit of olive oil, figuring that the flavor could only help, so it got a nice crispiness that you can only really get by cooking something in oil. The flavor, though, is where this burger really shines. It actually tasted just like a supreme pizza. I was very surprised. I wouldn't have been, if I'd read the ingredients first. It contains most of the same ingredients as a supreme pizza (bell pepper, onions, tomatoes, mushrooms, mozzarella cheese) and the things that it leaves out (sausage and pepperoni) are still represented. In one of my bites, I caught a distinct fennel flavor, which is a very sausage-y flavor, and the burger as a whole had a mild spiciness, which is mostly what the pepperoni brings to the supreme pizza experience. All in all, I'd say this is a very tasty burger. I've eaten it again since the first one, and I'd recommend it to anyone who likes to eat supreme pizza. This is a strange yet tasty burger. A little while back, I got an e-mail from a reader who was on the hunt for vegan chicken nuggets. I took a peek in my freezer and saw a couple different vegan chicken nuggets that I'd apparently been hoarding, so I threw them in the oven to test them out. This review is for you, Carol! Thanks for reading! 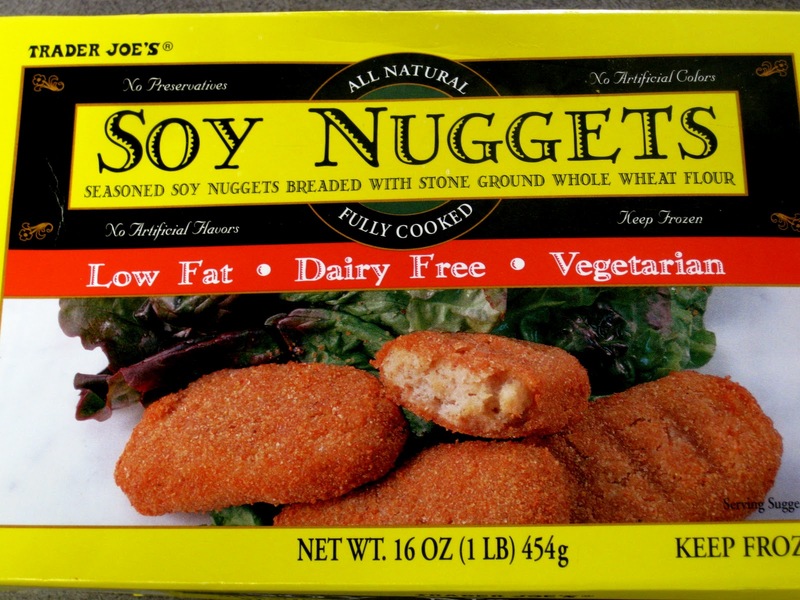 First up, Trader Joe's Soy Nuggets. These cooked up crazy-fast in the oven. I believe it was about 4 minutes, then flip them, then another 4-5 minutes and then they're piping hot and crispy! Just like magic! Sort of. Anyway, once these were out of the oven, it was time for the tasting. I poured a few different condiments on my plate to test out some different flavors, but as usual I started out with a bite of the plain nugget. Gotta be scientific about these things, you know. The exterior was nicely crispy, which doesn't seem to be too difficult to do with enough time in an oven. The inside was a little mushy, but really not bad. Not as mushy as the Chic-a-roos from a while back, but still not perfect. There wasn't much flavor to speak of, aside from a frozen-then-baked sort of flavor. You know the flavor I'm talking about, right? The not-much-flavor thing resulted in a sort of blank canvas for condiments, though. Pretty good with ketchup, ok with barbecue sauce (probably better if you like barbecue sauce more than I do), surprisingly tasty with ranch dressing. Thought about whipping up some honey mustard, but I only had one nugget left and it sounded like too much work for one nugget. Next time, though. So yeah, Trader Joe's redeems itself once again with a not-too-terrible product. You're about 50-50 at this point, TJ. Better pick up the pace.